If you are looking for professional and affordable driving lessons in Chesterfield, look no further than Wigham Driving School! We offer a range of driving lessons and intensive driving courses at competitively low prices, and our dedicated team of highly skilled and experienced instructors tailor each lesson to your specific needs and capabilities. Whether you have never driven before or require a few extra lessons before your test, our driving instructors work closely with you to provide you with the skills and knowledge necessary to become a safe and confident driver, ensuring that you are completely prepared to pass your test successfully. Our lessons always last a full hour and are conducted in modern, fully maintained cars by male or female Approved Driving Instructors. Wherever you are in Chesterfield or the surrounding areas, we will be with you promptly, on time, providing a reliable and superior quality service. So for more information, simply contact the friendly and highly experienced team at Wigham Driving School today! 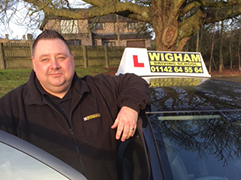 Wigham Driving School is a Chesterfield based driving school, offering patient, reliable and only fully qualified driving instructors. Telephone 01246 511247	• Email info@wighamdrivingschool.co.uk • © Wigham Driving School 2019 All Rights Reserved.